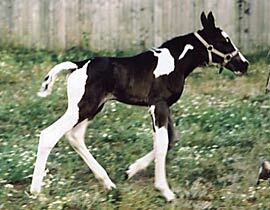 This filly has stunning markings and gorgeous, correct conformation. 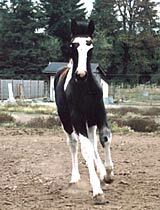 Her sire is a 17-hand black and white purebred Clydesdale and her dam is a black and white Selle Francais/TB mare out of a Bonjour daughter. 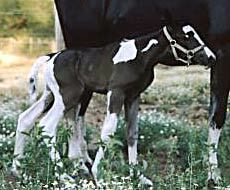 This filly may be homozygous — and always produce color. 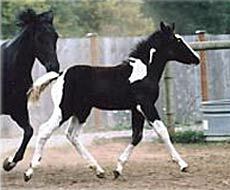 You won't find a combination of color, markings, breeding and movement like this! Natural, uphill movement and what an overstep! This is an extra, extra fancy filly and needs a show home. Don't Miss Out! If you are “horse hunting” for a horse very similar to this in age, color, size, suitability, and training level in the, please send us an email and we'll notify you as soon as one might be available! Please let us know your specific needs and we'll do our best to find a perfect match within your budget.